Thank you Fort Collins Chamber Red Carpet committee: You helped us create 400 birthing kits and You helped us meet our goal of completing our 1000th birthing kit by end of 2015. What an awesome group of business members to partner with. We truly appreciate your support. The Birthing Kit project was started in 2013 in the Zonta Club of Fort Collins to introduce young adults interested in pursuing further education in the health professions to global women's healthcare challenges. The students are shown a PPT introducing them to various Global women's healthcare issues, then the students make birthing kits. A birthing kit fits into a quart size zip lock bag and includes the following: large sheet of black plastic, 4 x 4's, razor blade to cut the umbilical cord, pair of gloves, small bar of soap and cotton strings to tie off the umbilical cord of the newborn baby. These birthing kits save lives of both the mom and the baby. If the mother does not have a sheet of black plastic with her when she reaches any clinic/health facility when it time to deliver, she is turned away and delivers where ever the baby is ready to be born. The first year we shared this project with students involved in the HOSA the students, as they put the kits together, were overheard saying " I saved a baby today", " I saved a Mom today", "I saved two lives today". 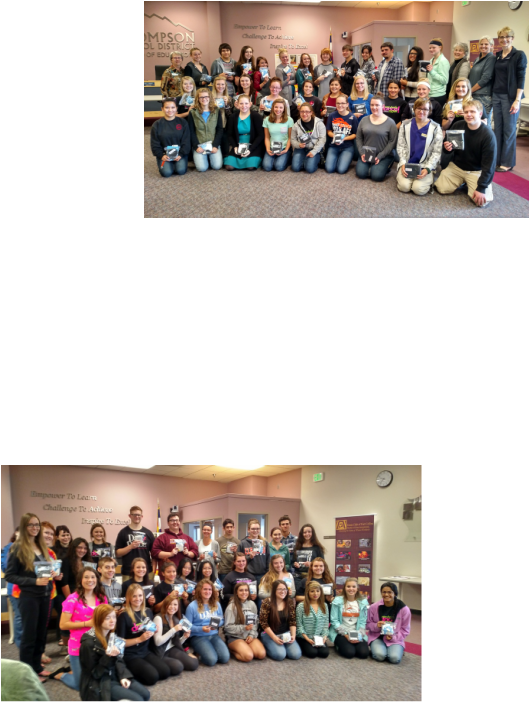 What an awesome experience, these students in Colorado knew they were making a difference in a Mom and a baby's life! HOSA (Health Occupations Students of America) is a Leadership program which is a vital curriculum and included within their (CTE) Career and Technical Education Health Science Technology Education programs which introduce each young adult to various aspects of the heatlhcare professions. We are continuing this project with the Front Range Community College/Larimer County Health Science Technology Education (HSTE/HOSA) program. This program is a (CTE) Career and Technical Education program where the high school students receive credit as they learn hands on skills in healthcare professions and they learn work force readiness skills as well. We will be able to share this project with approximately 80-100 students per year and the students will make approximately 400 birthing kits per year. What an awesome experience. May 4, 2015 the two classes created 400 birthing kits. See pictures below. The Zonta Club of Fort Collins partnered with Beth and Jim Heckel of www.ThinkHumanity.org, a nonprofit in Loveland, CO just (10) ten miles south of Fort Collins. Since 2007 their family non-profit has built (4) four health clinics, donated 1000's of mosquito nets, built 100's of fresh water wells and initiated schools for girls close to Ugandan Refugee camps. Beth takes our birthing kits to their health clinics. Thank you ThinkHumanity for allowing us this life changing opportunity. Medical Careers Classes AM and PM May 4, 2015 Created 400 birthing kits between two classes. This picture and one above.